Guns don’t kill people, people kill people, has been the big selling point for the defense of the antiquated Second Amendment. Would there be cybercrime without the Internet? Do you ever hear drugs don’t kill people, people doing drugs kills people? Would there be homophobic bullying if it weren’t for religion preaching its alleged immorality through indoctrinated hate? Why is it the preponderance of guns is NEVER the reason for gun violence? With less than 5% of the world’s population, the United States is home to roughly 35–50 per cent of the world’s civilian-owned guns, heavily skewing the global geography of firearms and any relative comparison. Our culture of guns has armed our citizens with roughly 88 guns per 100 people. The main reason is because the NRA, with the help of ALEC and the Heritage Foundation rule America through the Republican Party (and a few Democrats as well). Most of the nation’s most lax gun laws are passed by Governors with GOP administrations, such as Rick Scott in Florida. The GOP has an alleged “family values” message, but this couldn’t be farther from the truth. The Republican Party is a criminal conspiracy to betray the well-being of the American people in favor of oligarchical and corporate interests, and insane fundamentalist religious groups. Gun rights, not human rights, are far more important. This is only befitting of a party who takes the wrong side of every single issue since the New Deal. The attack on anyone who comments on the easy acquisition of firearms is generally brutal. Bob Costas and Jason Whitlock candidly voiced their opinion on our gun culture after the tragic murder suicide of Kansas City Chief Jovan Belcher. This was met with disbelief by those who, let’s face it, cling to their religion and their guns. I found it to be an absolutely honest and heartfelt observation where they admit handguns do not enhance our safety. They exacerbate our flaws, tempt us to escalate arguments and bait us into embracing confrontation rather than avoiding it. If Belcher didn’t possess a gun, he and Kassandra Perkins would both be alive today. Our current gun culture ensures that more and more domestic disputes will end in the ultimate tragedy. More convenience store confrontations over loud music will leave more teenage boys bloodied and dead. The outrage was not directed at the actual murders or the easily accessible guns, but at those who criticize our gun laws! The gun-rights zealots’ criticism can be aimed at politicians or any public figure who dares challenge their insane logic. So our culture, enhanced by strong-arm tactics by powerful lobbies and hate groups, is obsessed with guns. I can easily understand someone’s right to defend themselves or hunt, but why the need for large capacity ammo clips or assault rifles? When is it going to end? Can I get my own personal surface to air missile just in case I want to shoot down a potential enemy drone or if I’m paranoid about my “Socialist-Marxist government?” Why is it President Obama has done absolutely nothing to restrict gun owners’ rights yet the number of hate groups who advocate the most lenient gun laws is at an all time high? Largely because they have managed to appeal to the American psyche by invoking Jesus Christ, the most popular deity in America, to their cause. This psychosis fostered by hard-right wingers creates a culture where any organization trying to promote peace and minimize destruction is looked upon suspiciously. The TeaPartiers in the Senate recently voted to reject a UN treaty essentially promoting the world’s adoption of OUR very own ADA which intends to treat the handicapped in other countries with greater dignity and equality. Led by Senator Rand Paul (R-KY) and SenatorJim DeMint (R-SC) (who recently announced his retirement to head the Heritage Foundation), they convinced enough of their sympathizers to humiliate the handicapped in their very own chamber, especially esteemed GOP Senator Bob Dole. The Teaparty is still trying to convince its NRA-obsessed sympathizers that we are truly turning into a Marxist-Socialist nation. It’s no coincidence the Southern Poverty Law Center has labeled the Family Research Council, a huge supporter of DeMint, as a hate group. So what recourse do sane, thinking Americans who love this country and the Constitution have? Based on the most recent elections we have already begun by sending a few of these hard line crazies back home. Hopefully, the NRA and its Religious Right organizations will be emasculated to the point of impotence. Firearms must be more closely regulated than they currently are. If the TeaParty could lose its grip on our government, perhaps there will be more regulations placed on gun show sales and will discourage the emotionally volatile from arming themselves to the teeth. Our Constitution was designed to protect our citizens not just from tyrannical government, but from general anarchy and violence. 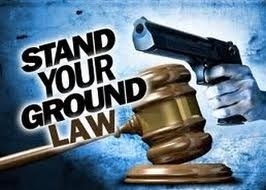 Stand Your Ground and other such flawed laws must be amended to do what they should do: protect ALL Americans. Next Post Is Religion Leading America to the Dark Ages (or have we never left)? In my humble opinion, before writing this article,author should read more about historical impact of gun ownership insocieties. I do not support immature societies(like that of US ) arming to teeth, as it is clear that they do not have enough mental development to own it ( just like you dont allow people drive without adequete skills) . On the other hand, before guns became available to public(circa 16th century AD), justice simply meant Whoever is strong enough to intimidate others became landlords(Knights), and enslave populations (peasantry). Guns changed than and eventually paved the way to modern democracies, which also should fear that people may decide to water the tree of liberty from time to time. Disgusts me how the right-wingers are saying that Obama only cried crocodile tears. Wow, they are so moronic. Then you have the defeatist attitudes in not just this but climate change as well. There’s nothing we can do so let’s do nothing and not even try. That trying a little step at a time might save even one life doesn’t seem worth it to the defeatist and that sometime down the track, maybe not even in our lifetime, a country or planet could achieve a gun free society is not worth it to them. Trying is always worth it, even if it ends in failure. You never giving up trying to do what is right and being a defeatist is not trying. I’d like to start by making gun shows illegal. Then ban all assault weapons and on-line ordering of ammo. It should be far harder to acquire anything regarding a gun than it is to register a car or get an abortion in Mississippi. We all know it’s not the case, but we need to try. I won’t stop pushing for more sensible gun laws hopefully leading to a revision of our antediluvian 2nd amendment. My children demand a world not filled with homegrown American terror. Iain, I actually agree with you. Plus a buy-back scheme as was introduced in Australia would be too costly. Impossibly so. Pity. I think nothing is costlier than the lives of innocent children. Why can’t we buy back weapons? We afforded 2 wars totaling $3 trillion, why not clean up our crazy gun culture? No matter what its financial price tag. Good point, Jessie. A small price compared to the costly wars. I’m always amused by the argument that; ‘Guns don’t kill people, people kill people’ as the argument for the right to purchase automatic military weapons in large numbers. No, sorry, but it’s ‘People with guns, or some other weapon designed to kill people, kill people’. I’m afraid that I have to agree with Iain and Miglo that the gun culture is so embedded in the USofA, where the country in reality is run by powerful interest groups, that any attempt to change the culture will ultimately fail. Guns have to go. I will make that point, but I just can’t see it happening, not with the crazy Republicans running around in America. I’d love to see a government in America have the guts to ban and buy back weapons, but they will have trouble breaking up a culture. It will be messy. I think that you will find that there is far more than just Republican support for personal gun ownership in The USA there must be when you get to the level of arms saturation that is evident in that country, Further no matter how many compassionate people sympathise with the families of those dead children there will remain a nagging fear that any change to the “right” of law abiding citizens to own guns will just tip the balance too much in favour of the criminals who will still be armed too the teeth. Like you I abhor fire arms but I just cant see how there can be any meaningful change in a society once guns are ubiquitous in a society. PS – I’m thrilled to see you guys from Café Whispers over here. And there I was thinking I was the only one interested in American politics. It’s as if the Civil War never really ended. Americans have never really understood the concept of peace. There’s just no money in it. Very nicely put Mangrove. There’s money munitions! I didn’t realise I was posting on “vegasjessie”. I thought I was on C/W. So I clicked on Home and read some back issues. This is a great blog. Thanks for cross-posting Migs. With progressive blogs like Jessie’s maybe there’s hope for the US yet. She’s great, isn’t she Mangrove. I’ve linked her blog to our new Blogroll and I’ll be re-posting more of Jessie’s great posts in the future. The aim is to network with other like-minded blogs globally. Australia suffered 13 mass murders between 1981 and 1996. In the 16 years since our gun law reforms: zero. No more excuses please America. Yes, good people can kill bad peope with guns, that is if they get in first. Bad people without guns will find it much harder to kill anyone.